FTE Count to be replaced by Knowledge Workers and free of charge Light Users. Desktop products to be replaced with Microsoft 365 Education A3/A5 (Other qualifying products available). Office 365 Education to be renamed Office 365 A1. Knowledge Worker count may be decreased as well as increased. Server Installation Rights for Exchange, SharePoint and Skype for Business. Enhanced Student Use Benefits depending on qualifying product purchased. Mitigation Plans and Contract Extension. Work at Home rights retired in favour of Home Use Program. ESPA agreement to be removed. Office 365 A3 is added. Microsoft 365 Education A3/A5 is not available. Windows 10 Education A3/A5 per user is not available. No minimum number of licences. Knowledge Worker count to get Student Use Benefit. 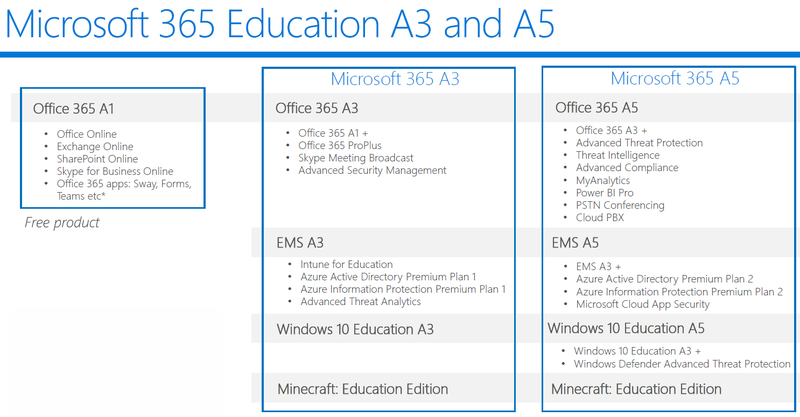 Microsoft 365 Education A3/A5 available. No rights for Office Pro Plus. No Windows 10 downgrade rights. Keep checking for updates as additional information is released from Microsoft. What does the Intune for Education include in the OVS-ES Agreement? Does it include cals for access? Intune for Education includes device management for Windows, iOS, MacOS and Android, a streamlined user interface for education and select Azure AD Premium features which include SSO, dynamic groups and Password Writeback. It is either purchased as a per user licence or outright per device. Currently MS provide unlimited 365 Faculty and Student licenses ignoring the FTE count on the Campus agreement. Once a KW count is declared how will that afferct the A1/A3/A5 licences? Will the A3/A5 licesnses match the KW count or will there be leeway for others? Under EES2017 licencing is based on KW count, which you declare at your anniversary. For staff you need to assign a per user licence to each KW giving the ability for instance to assign Office 365 Pro Plus to any device. Because you need to assign a licence to each staff member, if your KW count increases during the year, you need to purchase extra licences to cover the new KW at the time needed. This will be prorated and you can either pay when the new KW licence is ordered or at your anniversary date. A1 licences for faculty are available free of charge for Lite Users. For each KW licence you have you are allocated 40 free student licences for M365 A3/A5, Office 365 A3/A5, EMS E3 / E5 and windows 10 A3/A5. I understand that the Office 365 Education Plus for Student licences will remain in your tenancy. If we want to assign computer licenses to a classroom in CSP, do we need to buy licenses for all knowledge workers? Or, it is enough for selected Knowledge workers only and we can assign the corresponding amount of licenses. For example, 1:15 for office Pro Plus. Can you give me the exact wording of the license terms for this case? Great post. this is the perfect blog for anyone who wants to know about Microsoft software. Thanks for sharing this information with us. Keep posting and keep sharing like this.